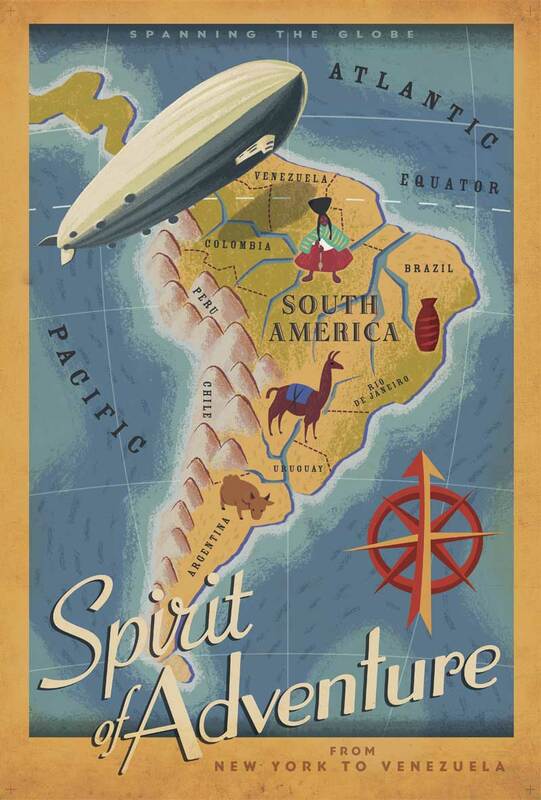 Do these words “Spirit of Adventure” make you feel great? These words takes me to my positive side, and tells me: I can do anything in this world!!! … and also takes me to this wonderful and spectacular Disney Movie UP !! 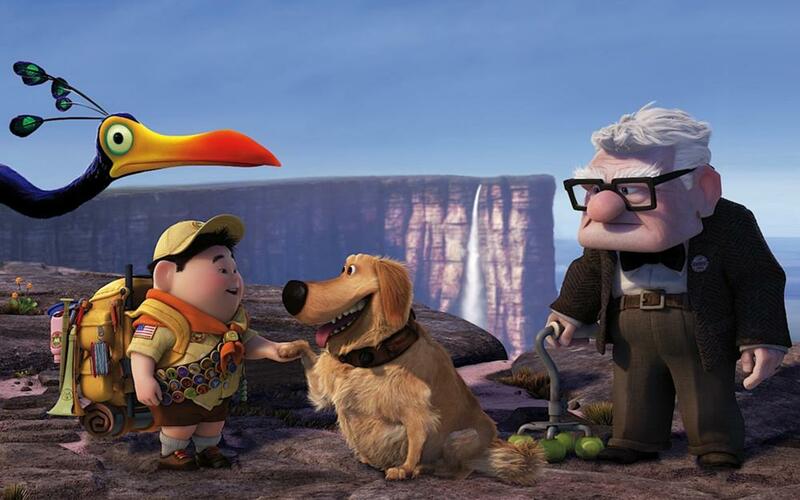 A little Boy Scout with his Spirit of Adventure alive and an Old Men determined to make his dreams true. If you haven’t watched that movie, need to. You won’t regret it! Do you have your own to-do list? Well never is late to start. Scouts Organizations have all kind of outdoor adventure activities, many people remind many courses, such as skydiving, hiking, camping, backpacking, rock climbing and bungee jumping etc. If you are outdoor enthusiasts you sure enjoy these activities. Not only the adults are interested in those activities, child likes too. Some school and communities launch similar adventure activity training, which is a kind of new educational modes taking students as the center, to present ability education and teach students to meet the challenges and has a positive spirit of adventure in their future daily life. It’s the perfect way for scouts to experience the activity. One of them is the Scouting’s Outdoor Adventure on The River(SOAR). It offers hiking, camping, backpacking, rock climbing, whitewater rafting and kayaking trips and so on. 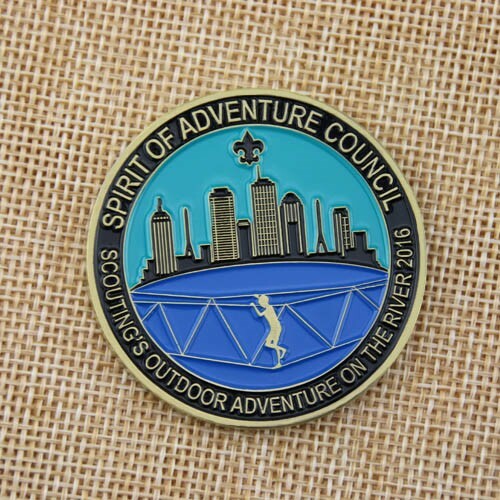 To encourage that spirit of adventure, after the training, the Spirit of Adventure Council award the customized challenge coins for all the participants and volunteers. The custom coins are filled with several enamel colors on the center, carving with a bridge climbing scout over the river, and the high blocks buildings far away on other side. 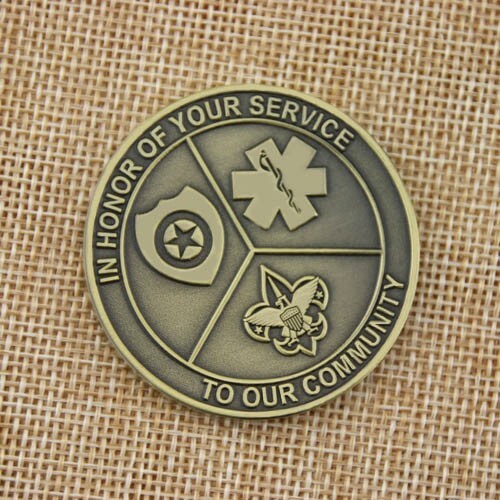 On the back, the award coins are depicted with three sponsors symbol and proudly display with” In honor your service”.